The movie didn't have a release date until the end of 2016. So I marked my calendar and checked my local cinema. I would later discover that it wasn't being released in Canada. Well there's this thing called the internet and well— I've seen the movie now. Did it live up to my expectations? Is it every bit as Rock and Dog as I'd hoped for? To give a brief assessment: it's inoffensive, doesn't resort to crude humor, has some charm to it despite not having the most memorable characters, and is a perfectly acceptable kids film. 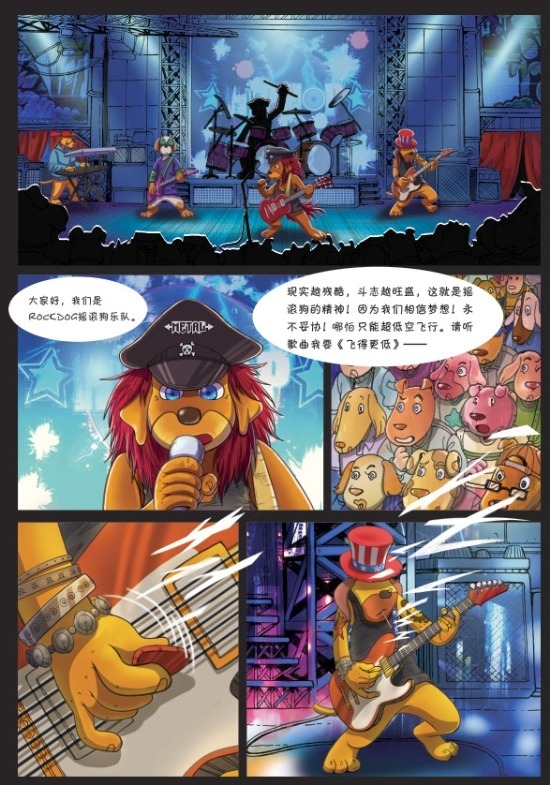 So Rock Dog is about a Tibetan Mastiff named Bodi (pronounced Bow-Dee), and his thirst to be a musician. Only issue is, he's living as a relative outcast high on Snow Mountain with his dad Khampa. Their job is to protect a village of absent-minded sheep and a solitary yak from an 'army' of wolves who would really love to just eat them all up. You know, as wolves do. The central conflict revolves around Bodi and his dad as they disagree over his future. The father is of the belief his son will take his place as the future guard of the village, where Bodi wants to leave and follow his dream. When Bodi does later leave to go into the city, that conflict is tossed aside. New conflicts and challenges emerge, such as Bodi having to deal with the wolves that are trying to capture him along with the difficulty of trying to be a musician in the real world. There's a theme in the movie about finding your passion— 'your fire', as they call it. However even that isn't particularly brought up a lot, which might be a good thing. Themes that get too in your face can be unbearable at times. In most people's lives, they don't spend every waking second thinking about that sort of thing. There are parts that kind of come out of nowhere in this movie, and they can be jarring but I don't think they hurt the movie's overall feel. The yak character sometimes makes comments to the audience but they can be easily ignored as they don't really matter or effect the story at all. Though I am happy to report that despite the trailers, the film is purely platonic. There is no romance as far as I can recall. Any warm smiles the characters give is a sense of mutual accomplishment or a personal goal being met. They're bland, okay? Other than Angus Scattergood, they don't really have a lot of highs and lows. They're relatively one-dimensional, though the inner conflicts try to give them some flavor. This is probably a good time to mention the character design and writing in contrast to Zootopia. I think the choice of a Tibetan Mastiff and the teenage style look they gave Bodi is very cool. It might not be unique to humans but in terms of animated anthros, Bodi might be the first to rock a beanie like that. And I'd say that Bodi's design is arguably more unique than Nick Wilde's. Outside of Bodi, the character designs aren't great. They all do their job in distinguishing the characters from one another but without being defined properly, the characters just don't really stand out. With motivations such as making it in music or finding your inner fire being so prevalent, it's really a wonder that these characters don't stand out. The writing for these characters is a major part of why they're so bland, but this is actually a weird sort of positive. Maybe this is because this movie was meant to appeal to China as well as America that it really lacks in the dumb, childish humor that is so prevalent in films from DreamWorks or Illumination. This is refreshing, honestly. To see a film that isn't all that interesting, but isn't desperately trying to make bathroom humor is a nice change. That might be part of why I don't think it's that bad as a movie. It's no masterpiece but it doesn't do anything to leave a bad taste either. I've read and heard other people's reviews of this movie before laying mine out. They do echo a lot of what I'm frankly too bummed to admit. The characters are flat, the story isn't great, whatever. But they tend to harp on things such as there not being enough Rock music, or the voice performances. Both of those, might I say, are fine. J.K. Simmons and Luke Wilson do good jobs as Khampa and Bodi respectively. Everyone else also does their part. The music? If you wanted AC/DC then yeah, you're gonna be disappointed. And the song in the finale of the film is actually just a modern uptempo pop song (though with clever writing, which is a step above Try Everything *coughcough*) with questionable mixing decisions rather than a hard rock tune. But you know what? There's plenty of emphasis and respect throughout the film to music that I think it's fine if the ending tune isn't an amalgamation of hard rock. There are quite a few times when characters just strum their guitars and even a point where two characters have a 'shred off'. The artistry is there, so I think Rock is as subjective as music itself. It doesn't always need to be a headbanger. I've long since thought the film was supposed to be a metaphor for actual Tibet and China, and the power of Western influences. I don't think I was too wrong either. Very broadly, the film is showing that the unity that comes from embracing uniqueness is enough to break down walls, and that hindering someone's potential can be a detriment to society as a whole. Self expression can be a good thing! Though the metaphor is muddled when you consider the wolves, which I would assume to be a representation of China's government, actually DO want to kill the sheep and it isn't an overblown fear of Western values coming in to corrupt the purity of China, but whatever. The film isn't perfect and it's not trying to be some grand, multi layered metaphor. I'm giving it the benefit of the doubt as it could very well be likely considering the inspirations for this movie and the book is was based on. To compare this movie to others to give you some clue as to where it stands, it's kind of like Over The Hedge but not as funny or crude. It has a good voice cast, maybe the same quality of animation (which some critics insist isn't good enough quality for theaters, but then also say it's too good for direct-to-DVD so make up your mind) and is a good kid's film. There isn't the same creativity in the character designs, backgrounds, or writing as Zootopia, but I would not dare say it is as bad as Norm Of the North. Considering the fact that Boss Baby and Smurfs: The Lost Village are both sitting at lower scores on Rotten Tomatoes than this movie, then calling it the Norm Of the North of 2017 is really cruel and unjustified. With films such as the Emoji Movie and Captain Underpants coming down the pipe later this year, it may very well end up being one of the better animated films of 2017. I hope with this review I didn't turn anyone away from this film. All I can do is say what was wrong with it and praise what it did right. You might just find yourself charmed by it like I was. I was probably more predisposed to like it since I've been excited for some time. However I was able to see the faults and I recognize it isn't nearly what I'd hoped it would be. But there was enough there for me to like and I hope you all find something to like in it too. I've spent a few days trying to make my thoughts on this movie into a cohesive review. There's definitely a lot to give this movie flack for, but it's hard to put into words the charm it has. I hope I didn't make the film sound appalling and that maybe you'll give it a watch with your kids, or your nephews and nieces. As an adult I don't think there's a ton to take away from this film, but I'd gladly put this on for my future kids during the furry indoctrination phase of their upbringing. Though, I'll probably still end up playing Fantastic Mr. Fox more! So that's my review! Have you seen the movie? Considering the US box office numbers, probably not. But go check it out when it's on DVD or Netflix! Feel free to comment with your thoughts. So, crossaffliction, we're cool now? Right? I watched it as a double feature with Get Out; I called it my "Children of Zootopia" double feature (a furry world movie and a critically acclaimed genre take on the current racial landscape in America, which Zootopia managed to squish into one movie) but as a horror/furry double feature, I don't know whether it was better or worse than my last one (Prometheus/Madagascar 3, in which one was a piece of utter crap, and one was a masterpiece, and if you're unfamiliar with me, you might be surprised by which is which); at least this time, both movies turned out at least alright. - The movie ironically seemed smashed together from the three furry world movies of 2016; Kung Fu Panda 3's Chinese/American co-production status, Zootopia's basic plot and Sing's musical elements. - Hey, sheeps are good guys and predators are bad (and actually, apparently, sometimes eat other sentient prey animals)! Feels downright repressive. - Eddie Izzard as Angus Scattergood seemed to be off in his own movie, for both better and worse. - Cassidy missed this, but Sam Elliot as the yak is basically reprising his role from The Big Lebowski. Except, you know, as a yak. - Speaking of yaks and other furry world movies of 2016/17, yaks had a banner year, though if your only images of yaks were Kai from Kung Fu Panda 3, Yax from Zootopia and, uh, IMDB is calling him Fleetwood Yak, I guess, well, you'd have no idea what a yak actually looked like. - Dharma is a vixen who plays bass, which is definitely something I would have noted in my review (and does mention that she thinks Bhodi is cute, so, for those keeping track at home, this is the closest any furry world movie of 2016/17 got to "cross-species pollination" after Sing also dropped the ball). 1. This movie feels less Chinese funded/oriented than the newer Transformers films which is kinda funny to me. 2. I think given that the wolves are like a mafia that possibly the carnivorial side of predator prey relationships may be illegal in the film's universe. 3. Agreed, though I'm hard pressed to dislike Eddie Izzard. 4. Never seen the Big Lebowski. Didn't think I needed to understand a kid's film lol. 5. Yeah I'm not familiar with yaks. 6. I think the crush is fine but it can be easily overlooked since it's never consummated, so to speak. I have been favorably impressed by the second trailer for Pixar’s forthcoming “Coco”, with Dante, a xoloitzcuintli, the national dog of Mexico. He really does look like a xoloitzcuintli. In the OK Panhandle, we call those chupacabra dogs. Do they have many xoloitzcuintli dogs in the OK panhandle? We have a high population of Mexican Americans, but they aren't bringing this breed with them. Winters too cold for furless animals (and I assume it's actually still a fairly rare breed, even in Mexico). But we're aware of them mostly because of reported "chupacabras" that inevitably wind up either one of these or heavily mangy coyotes farther south in Texas, where it's warm enough for hairless animals to survive. We like to feel superior to Texans, and jokes about "chupacabra dogs" is one way. Here is the new (fourth) trailer for "Coco". As someone who is half Mexican, I don't plan to see this in theaters since Disney tried to copyright "Day Of The Dead". That's like trying to trademark "St. Patrick's Day" or something, it's bullsh*t.
But yes the dog does look like a Mexican dog. And as for the mastiffs, it's called creative liberties. They aren't 100% accurate but meh. They did what they had to do and got cool looking characters anyway. The whole "Day of the Dead"/"Coco" issue sounds like a replay of the 1966 "Simba/Kimba" issue. According to Fred Ladd, NBC was going to rename Osamu Tezuka's Leo ('Jungle Emperor") as Simba and "Simba the White Lion", but learned at the last minute that it couldn't copyright Simba because it's a common word in Swahili (for lion). So NBC changed Simba to Kimba to make it unique and copyrightable. Supposedly Disney withdrew the "Day of the Dead" title because of protests from the Mexican community, but is that true, or did Disney get its copyright application turned down because "Day of the Dead" was already a well-known term? Yeah, but whether you see "Coco" in theaters, on DVD, or on TV (On Demand or pay-per-view), Disney will still get your money for it. How much is the movie Disney's and how much is it Pixar's? How much CREATIVE overlap is there between Disney and Pixar? Dante is a triple reference. (1) He's a xoloitzcuintli, Mexico's national animal; like the American bald eagle or the Russian brown bear. (2) Xoloitzcuintli means Xolotl's dog. Xolotl was the Mesoamerican God of the Dead. (3) Dante is famous for going to the Land of the Dead and back. The way I'm gonna see it, trust me, Disney isn't getting money. Also good on them for the triple reference I suppose, though I wouldn't exactly use the name of the species as a reference cause...you know...that's the name of the actual animal. My apologies; I don't understand your comment. The dog's name is Dante; he's a xoloitzcuintli, which is an actual breed; it's Nahuatl for "Xolotl's dog", and Xolotl is the God of the Underworld where much of "Coco" takes place -- how is this not a reference? If Pixar had made Dante a Chihuahua, or some breed without any Mexican connection at all, it would be taken as another example of Disney's cluelessness. And I still want to know how much of "Coco" is due to Disney, and how much to Pixar; or if there is any difference today. The insensitivity of the "Disney lawyers" and "Disney's marketing department" is notorious, but does Pixar have any say about the marketing of its films? Or are they all "DisneyPixar" mixed together now? I sincerely felt that his movie was under-rated. No it's no one's idea of an Oscar Winner, but in the pantheon of animated films recently it was definitely all right, and it definitely deserved to do better at the box office than it did. As a musician and a songwriter, there was a lot in this movie that made me laugh, or gave me some warm and comfortable fuzzies. I LOVE the idea of "rock park"! More cities should have those. Actually looking forward to Captain Underpants over here, and "cookies are for closers" in the trailer for Boss Baby was obvious, but cracked me up (not enough to make me want to see the movie, though). I grew up with Captain Underpants so I'm gonna see it, I'm just not getting my hopes up right now. Hasn't been a lot to sell me on it in the trailers yet. Do you recommend that I read the book before the movie comes out, or go to see the movie cold? I can get the book from the Los Angeles Public Library anytime. Oh, God no, that's not necessary. I mean, I was 11 in 1997, so about the perfect age to enjoy it (and then get nostalgic for it 20 years later), so that's why I care. You made a valiant effort to balance it out by comparing it to other, decent animated films, that could all also have the same thing said about them, but something about saying "it's better than Norm of the North" just turns me off of this completely. One thing I can say is that I actually do like the character designs in a way--they look distinct from a lot of other 3D-animated talking animals and we've seen quite a few lately. I've heard other people say it was the "Norm Of The North" of 2017 because of the questionable animation quality and the early release in the year so I wanted to dispell those rumors. I went to see Rock Dog with a friend, and although it's by no means an amazing film - it's not bad! We left the theater smiling. I'd say it's about a 6.5 out of 10, pushing towards 7 for the furry content. They definitely had a smaller budget to work with than most North American productions - a small cast of simple characters, plus a lot of the sheep and wolves all had the same design - but it had fun with itself. As long as you're not expecting a deep story or anything, you'll be fine. I do wish they'd put a little more effort into the wolves' motive - I was hoping for a backstory on Bodi's father, but no. I can't find the interview, but I could swear that somewhere I heard the director explain about the Tibetan mastiff mane problem, which is why Bodi wears a hat. For a Chinese-American co-production, there was apparently almost no executive meddling! It's a real shame that its distribution in China was sabotaged - I'd like to see more collaborations like this, but the overly critical North American reviews haven't done it any favors. As my friend and I discussed the film afterwards, we were both charmed by the lack of toilet humor. Despite the attempts to minimize the Chinese setting, it's still there - the downtown of the city, the characters eating in a ramen shop, and how Bodi could go from an under-developed rural village to a full-blown technological metropolis in the space of one bus ride. We also liked the message that Bodi's father was willing to stop trying to fit his son into his own mold, and give him the chance to go off and pursue his dream. I guess Tibetan mastiffs have some kind of chi-like inner force in this story universe, but they have to channel it. Bodi's father channels his through anger. Bodi takes a while to find his own way. And I found the movie's song, "Glorious", to be way more catchy than Shakira's "Try Anything". Basically, if you're in the mood for something uncomplicated, mildly silly, fun and furry, give Rock Dog a try! This is more just an observation than an actual rebuttal, but I'm still very disappointed 'Try Everything' was not nominated for Best Original Song at the Oscars, and whether you liked the song or not, it should disappoint all furries. You know we were this close to having an Oscar show feature Shakira dance with tiger fursuiters. And then have someone in a shark costume bumble onto the left side of the performance. Yeah...can't say I agree. Even now, that Sia penend disaster "Try Everything" is unpleasant to listen to. I'm happy, cause now Sia can't say she has an Oscar nomination. Shakira is so much better than that song. If anything, I hope the song proved she was still a pop culture presence so she can get her hands on a better song in the future. I don't think we were as close as you think. Wishful thinking for all of us, but the first step of being nominated was one that was a long shot anyway. Yeah; I heard there was something in the movie about why the mastiffs didn't have manes, but I didn't catch it. If it was even in there. Yas, uncomplicated but charming, Rock Dog is definitely worth a watch! Also, aren't you Canadian too? How'd you see the film? That is an incredibly appropriate way to watch Logan, actually. My sister took me in my wheelchair to see "Rock Dog" in a big theater in Burbank. I liked it; she didn't. But yeah, I would definitely recommend buying the DVD when it's released. According to multiple sources, it has a DVD/Blu-Ray release date of May 23, 2017. Oh great, another movie where wolves are the ultimate evil and must be destroyed. Thankfully it seems like this movie won't get seen by too many people. Hopefully the creators of this movie go walk off a cliff and drown. Hey, but one of them was voiced by Lewis Black, so that is at least one point in their favor, right? To get slightly more serious, “Rock Dog” was produced with Chinese financing by Reel FX Animation Studios in Dallas. What else has Reel FX done, besides a lot of contract work? “Free Birds”, released in November 2013. “The Book of Life” in October 2014. And it’s working on a “Beasts of Burden” feature, to be released in August 2018 (if it isn’t rescheduled), with several more in the planning stage. What’s next? Does anyone know? Poking around on their website, possibly something called "Wish Police" and "Untitled Kung Fu Space Western"? First I've heard of them. Yeah, I can't tell whether the character driving the car in the illustration for "Wish Police" looks like an anthro animal or not. Image 2 is, um, that's something, isn't it? e621 check reveals that Bhodi and K.K. Slider from Animal Crossing are an item for shippers, which is kind of funny; that pairing appears more frequently than Bhodi/Dharma. IMDb and the movie's posters spell Bodi and Darma without the h.
Just got done rewatching it; still so good. I ended up liking it way more than Cassidy. That's probably a little ironic. Definitely at least a little ironic. A Stork’s Journey? You mean that 2017’s animated features with anthropomorphic animal casts aren’t over yet? A bird nerd has to migrate to Africa – gosh, could they have seen Yellowbird? There was a bit of discussion of Yellowbird here when it came out.